UPDATED: Norwegian defense officials confirmed Friday night that Lt. Col. Siri Skare, the country’s first female military pilot, was among at least a dozen victims killed in an afternoon attack on the United Nations office in Mazar-i-Sharif in Afghanistan. Skare is Norway’s first female officer to be killed in service in the war-torn nation. At least a dozen UN staff members were killed and 20 wounded in the attack on the UN office, including one worker from Sweden and another from Romania. UN officials said seven of the dead were foreign personnel in Afghanistan and four were Afghan security guards who were overmanned by demonstrators furious that an American pastor had burned a copy of the Koran. Four of the demonstrators were reportedly killed as well. Skare, who finished her training as a pilot in 1983, had been working as a military adviser for the United Nations Assistance Mission in Afghanistan (UNAMA) since August of last year, according to the defense ministry. Those assigned to the UN are unarmed and work to provide aid and development assistance to civilians in Afghanistan, reported Aftenposten.no. “She was a highly respected officer,” Morten Hagalund, second-in-command at the military operative headquarters, told Norwegian Broadcasting (NRK). Skare, age 52, was originally from Åndalsnes in the county of Møre og Romsdal, lived in Oslo, was married and had one child. The Taliban took responsibility for the attack and said it was the first of a series of actions prior to the upcoming presidential election. It occurred after demonstrators began to march towards the UN offices after Friday prayers, to protest what they viewed as the American pastor’s highly provocative and offensive burning of the Koran. Some demonstrators began to attack UN security guards with knives and took their weapons, reported Oslo web site VG Nett, which has correspondents in the area where Norwegian forces have been stationed. Some demonstrators then forced their way into the building and began to shoot. Security was boosted around the Norwegian contingent based in Mazar-i-Sharif. “We are preparing ourselves for possible new attacks,” announced military officials. More demonstrations were reported all over Afghanistan on Saturday, and Pastor Wayne Sapp of a small church in Gainesville, Florida was being widely criticized for having stirred them up. Asked by Oslo newspaper Aftenposten whether he had expected such a violent reaction to his burning of the Koran, his wife Stephanie responded “of course.” She said they had “no immediate plans” for any more Koran burnings. 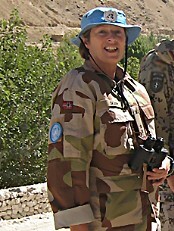 Norwegian Defense Minister Grete Faremo said the attack against the UN “is an attack not only against the UN and the international community’s work, but also an attack on the Afghan people’s future.” Faremo said her thoughts and sympathy were with the families of the dead, and those who survived the attack. Ten Norwegian soldiers have now been killed in Afghanistan and 25 seriously wounded. Norway has had troops in the war-torn country since May 2003. UN Secretary General Ban Ki-moon called the attack “cowardly,” adding that it could not be justified under any circumstances.